TWO FISHERMEN WERE brought safely ashore by emergency services this evening after getting into difficulty near Sherkin Island. The vessel, with two people on board, was departing Sherkin Island when it experienced engine failure. Both RNLI Baltimore lifeboats were called to assist the disabled fishing boat at 6.19pm. The disabled vessel had drifted onto Garrison point due to south easterly winds and, when the all-weather lifeboat arrived on scene, one of the fishing crew had jumped onto rocks ashore in an attempt to keep the boat off the rocks in a dangerous surge, according to a statement released this evening. Coxswain Aidan Bushe took the vessel in tow and brought her to safe moorings while the inshore lifeboat stood by, the Baltimore Lifeboat team said. 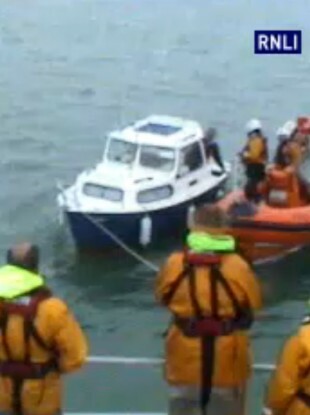 Once the boat had been secured, the inshore lifeboat returned the two adult men to shore. On board the all-weather lifeboat were Coxswain Aidan Bushe, mechanic Jerry Smith, Benny Cottrell, Sean McCarthy, Pat Collins, John O’Flynn and Ronnie Carty. On board the inshore lifeboat were Helm Kieran Collins and crew John McDonagh and Shane Sweeney. Email “Two fishermen rescued off Sherkin Island after engine failure ”. Feedback on “Two fishermen rescued off Sherkin Island after engine failure ”.